The Business Exchange Network (BEN) provides a structured forum where Chamber Members can increase their business by networking with other members on a regular basis and through business referrals. Every BEN member presents a 30-second introduction at each meeting, enabling them to hone their “elevator pitch” to perfection. BEN members are also invited to make a periodic 10-minute presentation to the group. BEN provides a supportive environment that allows each member to share products or services with others who want to help them succeed. Participation in BEN is limited to one member in any given business category or specialty, meaning once you join, a competitor of yours cannot join. BEN members agree to follow specific guidelines designed to maximize the profitable and successful of the program and its members. Click HERE to see members who are currently participating in the BEN Program. For more information see the BEN Rules & Committment form or contact the Chamber at info@GLBTChamber.org. Q. How many BEN Groups are there? A. We currently have three BEN Groups. Q, Are more BEN Groups planned? A. When the number of Members on the BEN Registration/Wait List allows, additional BEN groups will be created. Q. When do the BEN Groups meet? Q. Where do the BEN Groups meet? A. BEN Cedar Springs meets at Street's Fine Chicken on Cedar Springs. A. BEN Oak Lawn meets at Warwick Melrose Hotel on Oak Lawn. A. BEN North Dallas meets at The Mercury on Preston and Forest. A. BEN Legacy Shops meets at Henry's Tavern at The Shops at Legacy in Plano. Q. Do the BEN Groups meet year-around? A. Sort of. BEN Groups meet in two semesters per year. The first semester is January through May, the second semester is July through November. Q. Is there a fee to be in a BEN Group? A. Yes. The BEN participation fee is $250 per semester. This fee includes meeting materials as well as lunch/breakfast and valet parking where applicable. Q. Are there special requirements to be in a BEN Group? A. BEN members must all be members in good standing of the North Texas GLBT Chamber of Commerce. For additional information see the Business Exchange Network Rules and Commitment Form. Please complete the BEN Registration Form below; click 'Submit Registration' when complete. Registrations are recorded in the order in which they are received. You will be notified of your BEN placement as soon as possible. 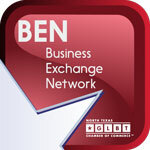 Please Note: Only Chamber Members in good standing may register for the BEN Program. Non-member registrations will be deleted. Brewing Up Business is a morning networking event designed to kick start your morning and your business in a short, one hour session. Attendees each have an opportunity to give a “30-second commercial” or elevator speech, followed by a sponsor presentation and open networking. It’s fun, it’s fast, and you even get a muffin. Brewing Up Business is where hot coffee and new business come to meet! What a deal! 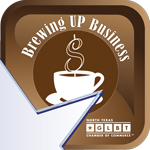 Brewing Up Business Sponsorship is only $100. Brewing Up Business takes place on the first Thursday of each month at Crickles & Co. on Throckmorton and Cedar Springs Road.Complete the form below and indicate the month you would like to be our Brewing Up Business Sponsor. The Fine Print: Sponsorships will be confirmed no later than January 31, 2018. Sponsor fees will be billed and are due upon confirmation. Failure to pay sponsorship fees may result in loss of sponsorship. Sponsorship fees are non-refundable. The Best Business Networking in North Texas! Business Connections Mixer is the Chamber's original member-to-member business growth program, occurring on the second Thursday of every month. With 40 and 60 members in attendance the Business Connections Mixer is fun, relaxed and safe environment where GLBT and allied professionals can network and enjoy each other's company. Experience a great Member Business, Meet New People, and Build Relationships while you make new Business Connections at the Chamber's Signature Networking Event. 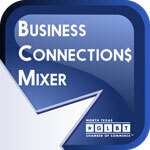 Interested in hosting a Business Connections Mixer? Check out the Business Connections Mixer Guidelines and then complete the BCM Host Request Form below. Registrations are recorded in the order in which they are received. You will be contacted by a Chamber volunteer within 30 days.